Tsurugajo castle was built in 1384, with its largest tower rebuild in concrete in 1965. 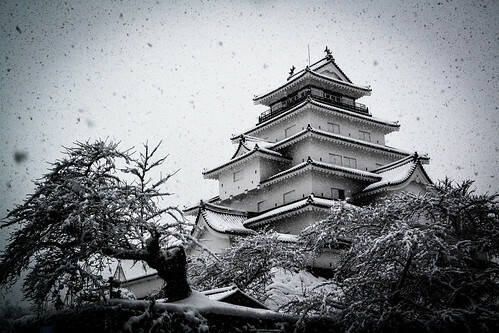 It can't be seen on the picture (was a snowy day), but its roof is actually red, which is quite unusual in Japanese castles. It's been popular recently for it was featured in "Yae no Sakura", a drama about Niijima Yae, the Byakkotai (teenagers battle group) and the Boshin War, fought from 1868 to 1869 which resulted in the end of the ruling Tokugawa Shogunate (Edo period) and the restoration of imperial rule (Meiji period), which put an end to the samurai system and with it the Japanese Middle-Age. This is one of the most interesting part of Japanese History and many films and books are related to it. One that come instantly to my mind is "The Last Samurai" (2003) with Tom Cruise and Ken Watanabe, quite a good film for an American one.